Flying can be tough. If you are traveling for business or pleasure being in close proximity of strangers could get uncomfortable and do not get me started on the food. Whether you’re an anxious or calm flyer, these are the essentials that will make your flight a bit better. My number one item I always pack are my noise cancelling headphones. 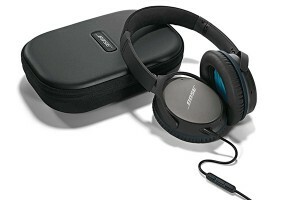 I recommend the Bose QuietComfort 25 Noise Cancelling Headphones (MSRP $299.95). These were a good investment as I get to loan them out when I travel with anxious flyers. They help people relax and concentrate on a movie or music while take-off, or landing (or even the whole flight). I would also suggest bringing your own entertainment device. This could an iPad or another tablet as there are still some airlines and flights that do not provide personal entertainment devices. External batteries are a strong essential. When you are on a 6 hour flight, working, and your tablet or phone dies you want a power source. 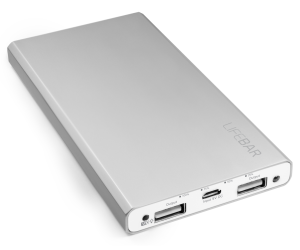 These days, majority of airplanes feature outlets in all classes but if you fly in an older plane, I suggest the Antec LifeBar 10 (MSRP $59.99) which charges my iPhone twice before getting to an outlet. A long wrap around cardigan is another essential. The Polo Ralph Lauren Flyaway Cardigan (MSRP $145) is my favorite. The Cardigan is made of cotton/silk material which is light enough to wear through security and onboard. You can keep it open or wrap it around as needed. 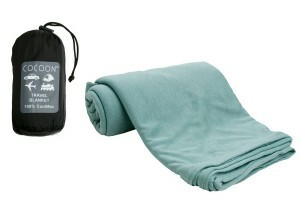 If you do not like Cardigans I would suggest this blanket Cocoon CoolMax Travel Blanket (MSRP $39). CoolMax is a compact (bundles into cup size) soft blanket that is perfect for travel. Its breathable material that wicks away moisture will keep you cool inflight. Thanks to its small size and convenient nylon pouch, it will be functional and easy to add to a carry on. Neck pillows can be difficult to choose due to many different options. I took the plunge last summer and bought the Cabeau Memory Foam Evolution Pillow (MSRP $34.99) at Kahului Airport (OGG) because it was late and I had forgotten my old neck pillow at the hotel. It provided the best rest with a memory foam layer plus customizable air. It also provided a pouch for my iPhone and nylon bag to store when not in use. 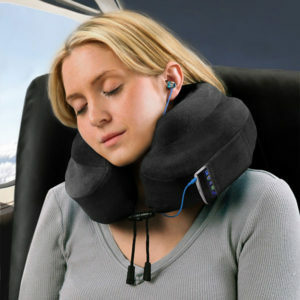 One great thing about this neck pillow is that it comes with a removable cover easy to wash. If you booked a red eye, you may booked it for a reason which makes an eye-mask a necessity. Even when planes turn off the lights at night, you will always catch glares from the kids on tablets and other peoples reading light or watching movie on the plane’s screen.. This small problem can be resolved by an eye-mask. The Sweet Dreams Sleep Mask with Carry Pouch and Earplugs (MSRP $12.95) has not let me down yet. You won’t be able to cross liquids thru security but go ahead with food. Food is more expensive on board and in airports. If your flight has no meal service included, I suggest bringing snacks like cut up carrots, almonds, or pees that you can snack on and pass around if you travel with kids. Also, after finishing security, stock up on a few drinks and snacks if you have not prepared any beforehand, just to have a bit of variety onboard. Napkins, wipes, and hand Sanitizer; might sound as a mommy necessities, but these are universal essentials. From wiping down your arm rest to helping out your flight companion, it could become the life saver you never knew. Most of the above are conveniently located in the checkout isles of drugstores or can be found in the airport gift shops. Pens are my final essential. Last time I was on a flight to Hawaii, only one flight attendant had a pen and more than 100 had to fill agriculture regulation forms. It took at least 30 minutes before I could use the pen and now I carry one with me on every flight.